Out of all the mechanical complications of acute myocardial infaction (MI), rupture of the free wall of the left ventricle (LV) is catastrophic. The precise incidence of aneurysm and pseudoaneurysm of heart is unknown, but it is even less common than cardiac rupture after MI, which has an incidence of 2-4%. , Rarely the cardiac rupture may be clinically undetected and lead to pseudoaneurysm. LV pseudoaneurysm is formed if cardiac rupture is contained by pericardium, organizing thrombus, and hematoma. This condition calls for urgent surgical repair. Whereas, in a true aneurysm, LV out-pouching is a thinned out wall but with some degree of myocardium wall integrity intact. Such an entity calls for elective surgery. Pseudoaneurysms are believed to have poor prognosis because of a high risk of rupture. We report the case of a patient with a pseudoaneurysm initially diagnosed as true aneurysm. We have reviewed the literature on this challenging diagnosis and outlined the characteristic findings of each clinical entity. A 65-year-old diabetic man presented to our hospital with chest pain and shortness of breath at rest and frequent awakening due to chest discomfort at night for about 10 days. He revealed a history of anterior MI 1 month ago. Percutaneous coronary intervention (PCI) was performed at that time for the blocked left anterior descending artery with a drug eluting stent. Post-PCI echocardiography showed a normally functioning heart. Physical examination indicated blood pressure of 140/85 mmHg, heart rate of 86 beats/min, and a continuous murmur at apical area. Electrocardiography (ECG) showed T-wave inversion in the infero-lateral leads. 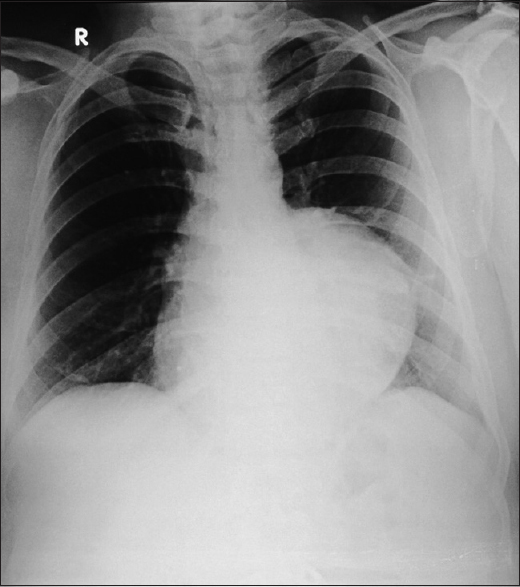 Chest X-ray displayed an oval bulge on the left border of the heart [Figure 1]. 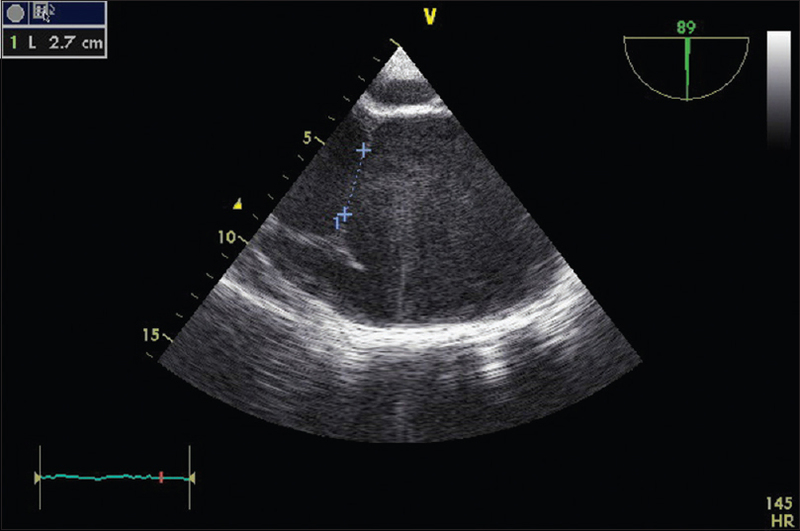 Transthoracic echocardiography showed a large oval anechoic area with a distinct thin wall at the lateral border of the LV, mild mitral regurgitation and good LV function. Coronary angiography showed normal flow in the left and right coronary arteries and the patent stent in left anterior descending. The preoperative diagnosis was an aneurysm of LV. Hence, LV aneurysmoplasty was the planned surgery. The patient was premedicated with tablet ranitidine 150 mg and tablet etizolam 0.5 mg on the night and morning of surgery. Anesthesia was induced with injection midazolam 0.05 mg/kg, injection fentanyl 10 mcg/kg, injection etomidate 0.3 mg/kg, and injection vecuronium 0.2 mg/kg. Standard monitoring techniques and transesophageal echocardiography (TEE) were used. Intraoperative TEE showed a large (8.2 cm × 6.9 cm) oval out-pouching from the posterolateral aspect of LV, which was communicating with the LV chamber through a passage measuring 2.7 cm [Figure 2] and [Figure 3]. LV function was good but with hypokinesia in the lateral wall. The wall of the cystic cavity was akinetic. 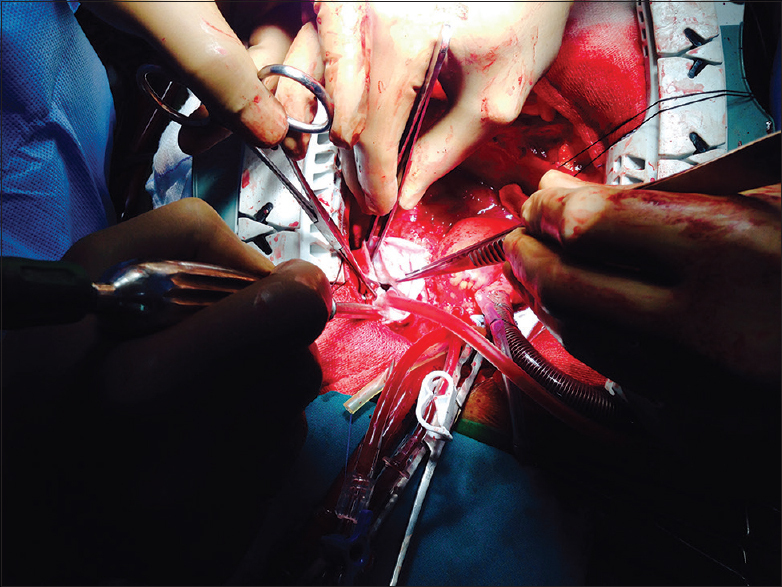 After going on cardiopulmonary bypass and administration of cardioplegia, the cystic wall adhering to the pericardial cavity was dissected and opened [Figure 4]. The wall of the cystic cavity did not show any myocardium. The redundant pseudoaneurysm was excised, and the defect on the LV wall was closed with pledgeted teflon. The durations of cardiopulmonary bypass and aortic cross clamp were 108 and 74 min respectively. Postbypass TEE showed hypokinesia of lateral wall of LV and good LV function. The patient was discharged on the 7 th postoperative day. At his 3 months follow-up, the patient was in New York Heart Association I status, echocardiography showed good LV function with an ejection fraction of 62%. MI accounts for most LV pseudoaneurysms and aneurysms followed by cardiac surgery, trauma, and infection. There is a higher chance for inferior wall MI rather than an anterior wall MI to result in LV pseudoaneurysm. This finding is consistent with the location of pseudoaneurysms on the posterior, lateral, apical or inferior surface of the LV. In contrast to LV pseudoaneurysms, only 4% of LV true aneurysms are located at the posterolateral or diaphragmatic surface. The reason for the detection of fewer anterior LV pseudoaneurysms may be due to the fact that an anterior LV wall rupture terminates in rapid hemopericardium, tamponade, shock, and death; whereas, posteriorly it tends to get contained by the pericardium and inflammatory adhesions forming a pseudoaneurysm rather than cardiac tamponade. , Current literature reports that 30-45% of ventricular pseudoaneurysms will rupture. Consequent mortality reaches up to 48% after drug therapy and 23% after surgical treatment. , Hence, pseudoaneurysms should be actively treated surgically. Improvements in surgical technique may have decreased the perioperative mortality rate to ≤10%. A thin or disrupted myocardium moves dyskinetically, can be akinetic, contributing to dangerous ventricular arrhythmias and cardiac failure. Stasis of blood flow inside the cavity can form thrombus and create embolic events. As discussed above, the signs and symptoms in the population at risk (history of MI, prior cardiac surgery) are neither sensitive nor specific for aneurysm or pseudoaneurysm. Therefore, imaging is usually required to diagnose or to identify the presence of other pathology accounting for the patient's signs and symptoms. 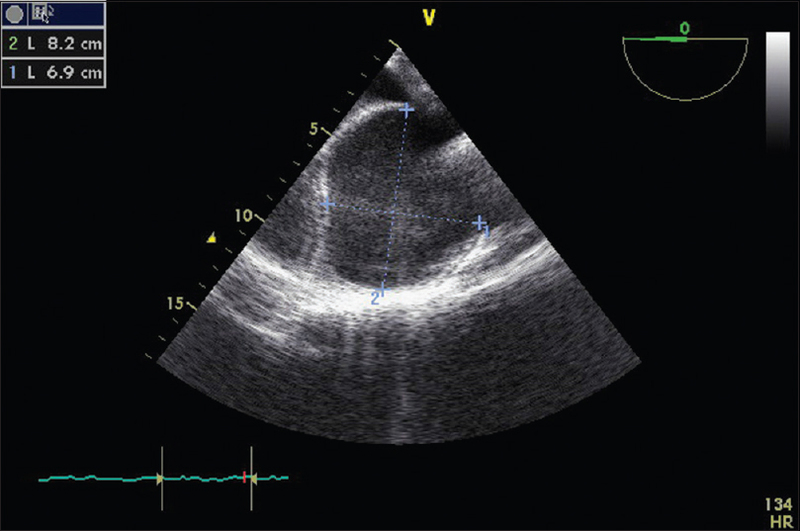 Initial evaluation with transthoracic echocardiography may be unrevealing, but in suspected cases, angiography, TEE, cardiac computed tomography (CT), and cardiac magnetic resonance imaging (MRI) will have a higher diagnostic yield. In two studies with small numbers of patients, an orifice-to-pseudoaneurysm diameter ratio of 0.5 by two-dimensional echocardiography was used to separate patients with pseudoaneurysm from those with true aneurysms. , This measurement alone, however, fails to accurately distinguish true from false LV aneurysms. Angiography of the LV and coronary arteries has been historically recommended as the imaging modality of choice. Angiographic findings that help distinguish false aneurysms include a narrow orifice leading into a saccular aneurysm and lack of surrounding coronary arteries. In addition, coronary angiography shows the need for concomitant bypass grafting and may also prevent inappropriate surgical ligation of the left circumflex artery. , Cardiac MRI and cardiac CT allow visualization of any plane of the heart and can thus show segments that are difficult to see on echocardiography. The high spatial resolution and tissue characterization of cardiac MRI make it ideal for evaluation of pseudoaneurysm of the ventricles and for distinguishing pseudoaneurysm from true aneurysms. In such cases, the use of late gadolinium enhancement to identify the location and transmural extent of prior infarcts is particularly valuable. Nevertheless, not all patients can undergo cardiac MRI because of either patient contraindication (e.g., implanted cardiac devices, claustrophobia) or lack of availability. Cardiac CT offers high spatial resolution and provides an excellent visualization of the LV myocardium, coronary arteries, and bypass grafts. Although cardiac CT is more widely available than cardiac MRI, it involves radiation and the use of intravenous contrast exposure. After diagnosis, no guidelines address whether to pursue follow-up imaging. For select patients managed nonsurgically, follow-up imaging to assess for expansion may be reasonable if it could affect management. However, the timing for such serial imaging must be individualized on the basis of whether the defect is acute or chronic, whether signs and symptoms associated with potential complications are present, and what the overall goals of care are. In spite of the advances made by various imaging modalities, peroperative evaluation of tissue layers remains the gold standard for diagnosis. Intraoperative TEE can be very useful for assessing the location, size and number of communications of aneurysm/pseudoaneurysm, the presence of mural thrombus, involvement of mitral apparatus, inter-papillary distance, global and regional function of ventricles, valvular regurgitation, left atrial size and diastolic dysfunction, etc. Maneuvers that may increase sensitivity of the TEE in detecting LV thrombi include the use of echo contrast or B-mode imaging, the use of highest transducer frequency, focused imaging of the region of interest, and color Doppler imaging. Posterobasal aneurysm is prone to develop a thrombus in the aneurysm. In our case, the inlet of the pseudoaneurysm was 2.7 cm and width of the cavity was 8.2 cm. Cardiac pseudoaneurysms are rare but clinically significant lesions. Although often challenging to diagnose, advances in noninvasive imaging improve the ability to distinguish aneurysm from pseudoaneurysm. Most symptomatic require surgical repair. Pollak H, Nobis H, Mlczoch J. Frequency of left ventricular free wall rupture complicating acute myocardial infarction since the advent of thrombolysis. Am J Cardiol 1994;74:184-6. Zoffoli G, Mangino D, Venturini A, Terrini A, Asta A, Zanchettin C, et al. Diagnosing left ventricular aneurysm from pseudo-aneurysm: A case report and a review in literature. J Cardiothorac Surg 2009;4:11. Brown SL, Gropler RJ, Harris KM. Distinguishing left ventricular aneurysm from pseudoaneurysm. A review of the literature. Chest 1997;111:1403-9. Gueron M, Wanderman KL, Hirsch M, Borman J. Pseudoaneurysm of the left ventricle after myocardial infarction: A curable form of myocardial rupture. J Thorac Cardiovasc Surg 1975;69:736-42. Balakumaran K, Verbaan CJ, Essed CE, Nauta J, Bos E, Haalebos MM, et al. Ventricular free wall rupture: Sudden, subacute, slow, sealed and stabilized varieties. Eur Heart J 1984;5:282-8. Higgins CB, Lipton MJ, Johnson AD, Peterson KL, Vieweg WV. False aneurysms of the left ventricle. Identification of distinctive clinical, radiographic, and angiographic features. Radiology 1978;127:21-7. Rittenhouse EA, Sauvage LR, Mansfield PB, Smith JC, Davis CC, Hall DG. False aneurysm of the left ventricle. Report of four cases and review of surgical management. Ann Surg 1979;189:409-15. Si D, Shi K, Gao D, Yang P. Ruptured left ventricular pseudoaneurysm in the mediastinum following acute myocardial infarction: A case report. Eur J Med Res 2013;18:2. Gatewood RP Jr., Nanda NC. Differentiation of left ventricular pseudoaneurysm from true aneurysm with two dimensional echocardiography. Am J Cardiol 1980;46:869-78. Catherwood E, Mintz GS, Kotler MN, Kimbiris D, Lemmon W, Parry WR. Pseudoaneurysm of the left ventricle complicated by Salmonella typhimurium infection. Recognition by two-dimensional echocardiography. Am J Med 1980;68:782-6.
al-Saadon K, Walley VM, Green M, Beanlands DS. Angiographic diagnosis of true and false LV aneurysms after inferior wall myocardial infarction. Cathet Cardiovasc Diagn 1995;35:266-9. Kupari M, Verkkala K, Maamies T, Härtel G. Value of combined cross sectional and Doppler echocardiography in the detection of left ventricular pseudoaneurysm after mitral valve replacement. Br Heart J 1987;58:52-6. Bassan R, Jasbik W, de Souza MA, Nogueira AA, Luz FS, Baldwin BJ. Subvalvular left ventricular pseudoaneurysm: A rare complication of mitral valve replacement. Cathet Cardiovasc Diagn 1981;7:269-73. Hulten EA, Blankstein R. Pseudoaneurysms of the heart. Circulation 2012;125:1920-5. Kim K, Savage RM, Sabik J, Lytle BW. Assessment in higher risk myocardial revascularization and complications of ischemic heart disease. In: Savage RM, editor. Comprehensive Text Book of Perioperative Transesophageal Echocardiography. 2 nd ed. Philadelphia: Lippincott Williams & Wilkins, Wolters Kluwer Business; 2011. p. 449-53.